Yoav Perlman - birding, science, conservation, photography: Swintail or Pinhoe's? 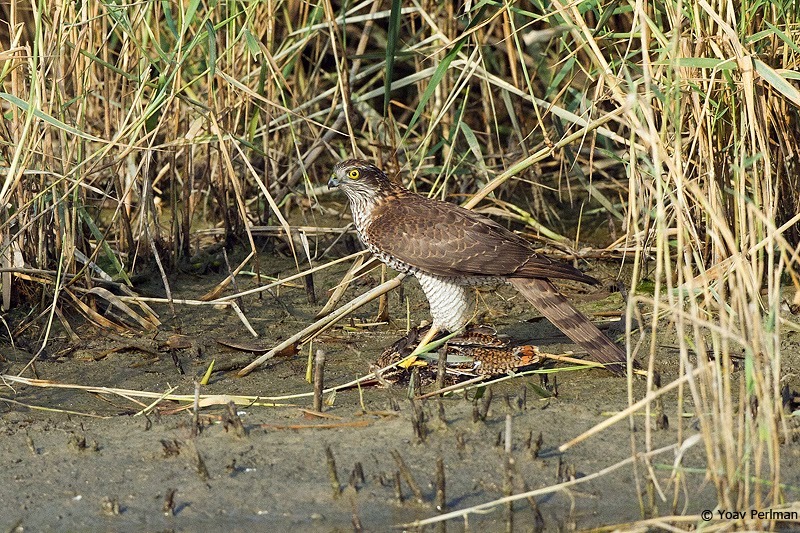 On Thursday October 10th Eyal Shochat and Yaron Charka found a 'Pin-tailed' Snipe and a Black-throated Loon at Ma'agan Michael - what a fantastic day they had! 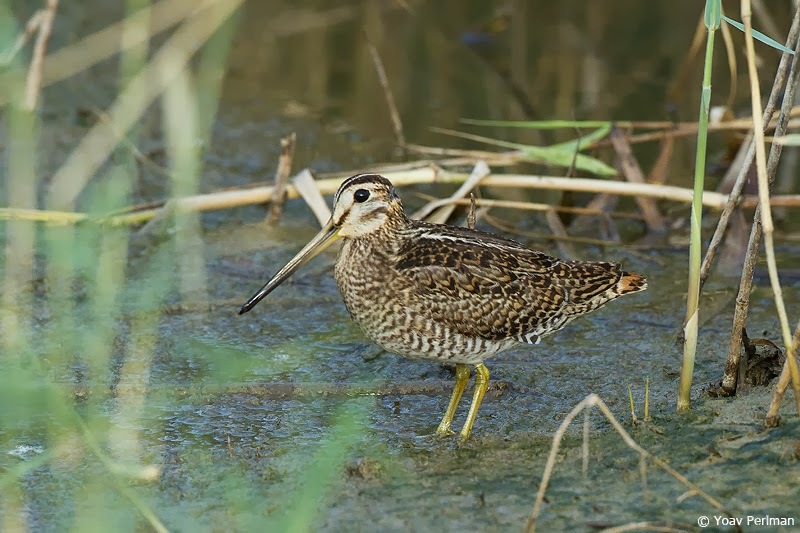 Of course the snipe is more interesting in a WP context; however both birds are mega-rare in Israel. 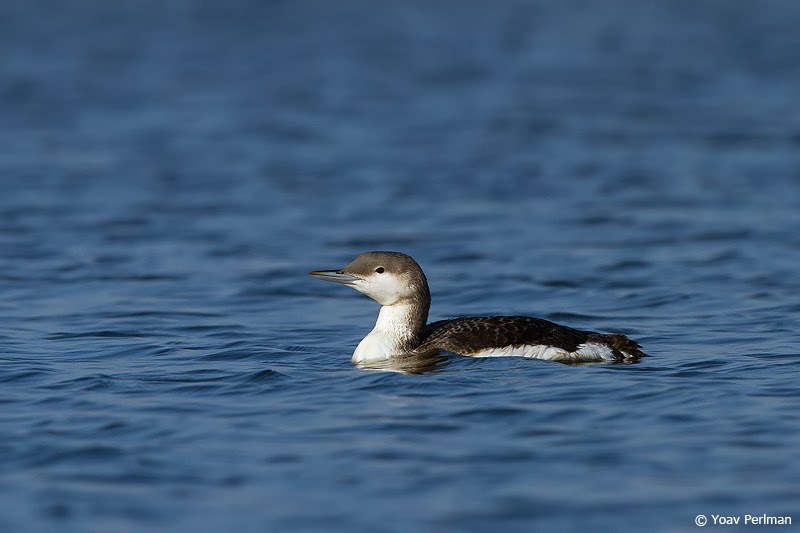 The diver is the earliest ever in Israel - they are typically recorded in December. I was not able to go on Friday or Saturday, but today I had the chance to catch up with these birds. Arrived at MM at first light. 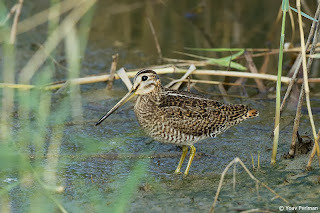 Took me some time until I got on the snipe - quite a skulker. 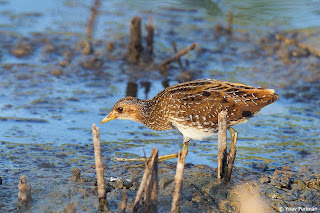 It behaves more like a crake than a snipe - feeds in the reeds, occasionally forages out in the open and runs back into the reeds when it feels danger. 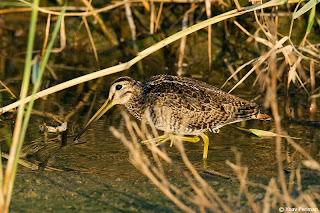 Separating it from a Common Snipe is quite easy - note the chunky, full-bodied structure (almost like a small Woodcock or Great Snipe), rounded head, 'open' head pattern (very thin loral stripe), heavily barred underparts, and most important - the pattern of mantle, scapulars and tertials: faint central mantle stripes, with no lateral mantle stripes. Scaps have a symetric anchor pattern, compared to common that has much more white or buff on the outer webs. 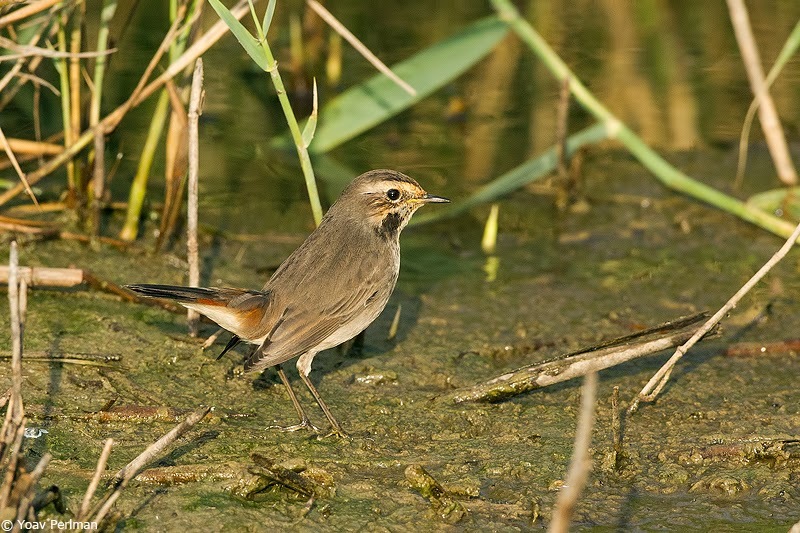 This individual has a longish tail, on the long end of the spectrum for pin-tailed. Normally they have a very stubby tail, hardly protruding beyond the tertial tips. Separating Pin-tailed Snipe from Swinhoe's Snipe is practically impossible in the field (i.e. 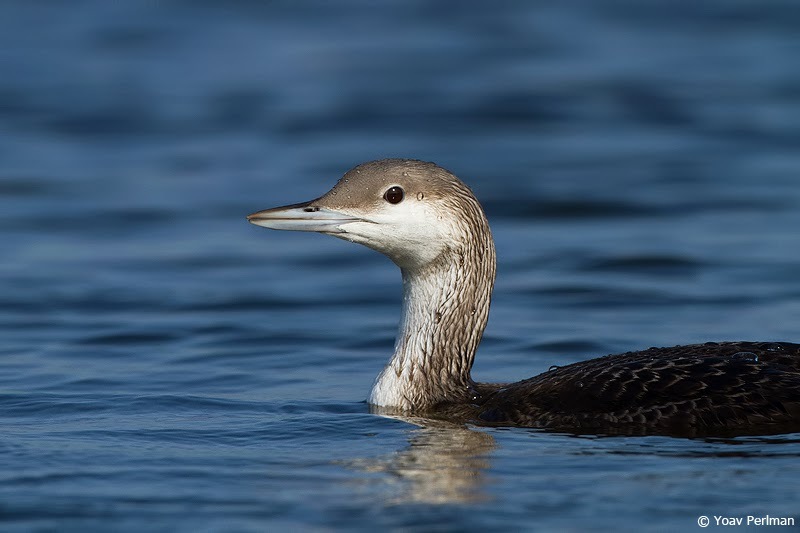 the excellent article by Leader and Carey (2003) British Birds 96: 178-198). This bird is rather large and heavy, but this means nothing apparently. The bird was silent. Several guys tried to get a shot of the open tail when it was preening but impossible to see the shape of theunique outer tail feathers. There are three positive records of Pin-tailed Snipe in Israel - all three ringed - the first in 1984 by Hadoram et al. 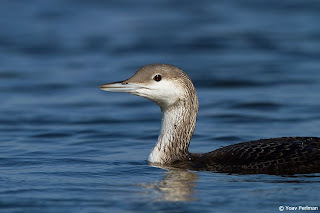 at Eilat, the second was found by Barak Granit and Rami Lindroos in 1998 at Kfar Ruppin and I ringed it a couple of days later, and the last one was ringed by Yosef Kiat in 2011 in Tsor'a. 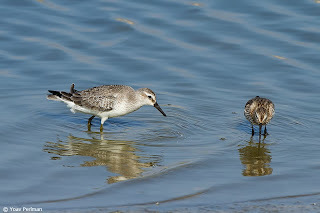 Apart for these records, another 6-7 birds were seen in the field (mainly in the Bet Shean Valley) but swinhoe's could not be safely excluded, though by default I'd guess they were all pintails. 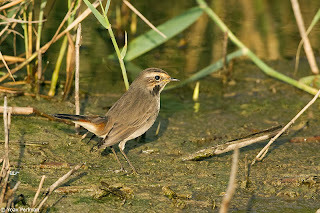 Yosef will try to catch this bird tomorrow night - hopefully it sticks around till then. I stayed with the snipe for some time but it was feeding in the reeds most of the time so left in alone and went to have a look at the loon. 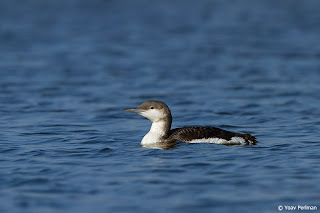 Loons are rare in Israel - Black-throated being the most recorded species with about 15 records. This young bird was very very tame - pretty exhausted I suppose. 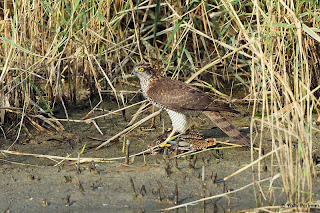 It was feeding well in a small fishpond - what an amazing and bizzare bird! 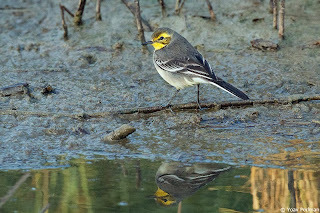 Before leaving had a quick look at one drained fishponds that is packed full with shorebirds. 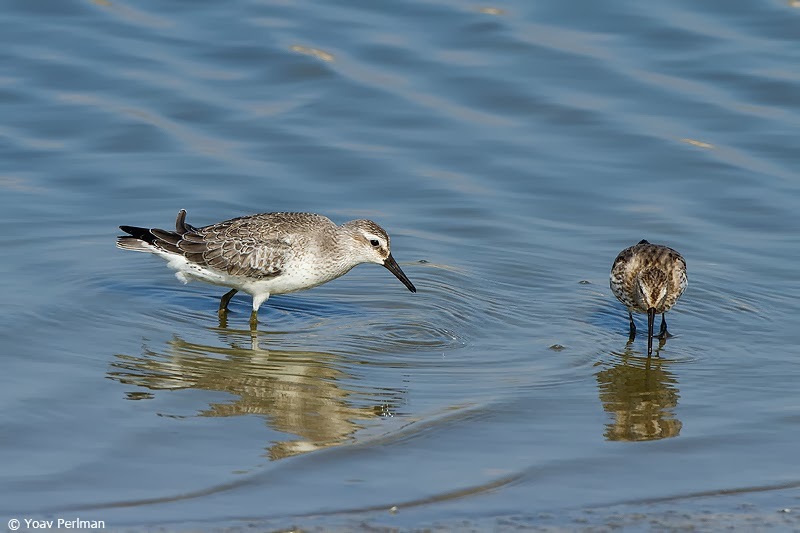 Had four Knots and two Bar-tailed Godwits (both species are good birds in Israel; these individuals have been around for a couple of weeks now).